Moving time: 3 hr 41 min. Weather: 52°F (11°C) in the morning; got up to 68°F (20°C) by end of ride at 2:00pm. Partly cloudy skies. It's nice to be able to take my time touring these days. About a week ago Joe and I started slowing our pace down since we're so far ahead. Today I rode a measely 38.5 miles but had to tackle a 2000 foot climb to the top of Keyes Creek Pass. There are only two more passes to go - Ochoco Pass tomorrow and McKenzie Pass the next day. We figure that there's no sense in tackling more than one major pass each day. After McKenzie pass it's smooth sailing to the coast and relatively flat riding up the coast toward Seattle. I hope the winds and rain hold back for the next few weeks. 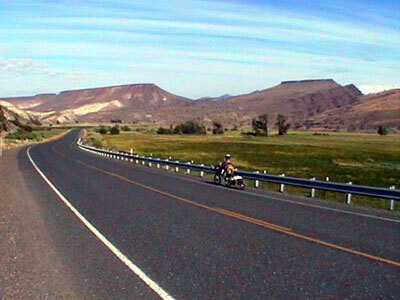 Here's a picture of me riding along US 26 about five miles west of Dayville. 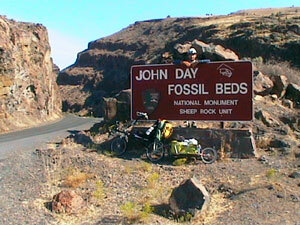 The route enters a portion of the John Day Fossil Beds National Monument. The beds themselves are on a spur from the route so we didn't actually see them. The Picture Gorge was very neat to ride through. 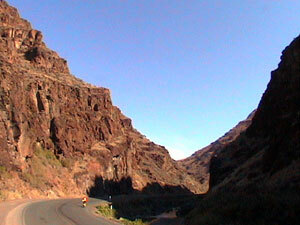 The walls of the gorge are very steep and rugged. 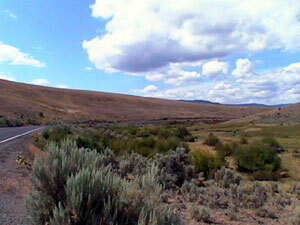 Geologists believe that the gorge was formed during a sudden event that "ripped" the ridge into two, allowing the John Day river to pass through the gorge floor. Joe and I met Mark Batterson, an eastbounder, just before we reached the Keyes Creek Pass. He is from Richmond, Virginia and started his journey five days ago in Portland. We stopped to chat for a while but he seemed to be in a hurry to move along. When I meet riders who are just starting it reminds me of myself two months ago. I had too much gear, my BOB trailer and gear were sparkling clean, I was in a big hurry, I had aspirations to reach the coast but didn't think I'd ever make it, and I hurt every day. Patience and perseverence are certainly keys to long distance touring. 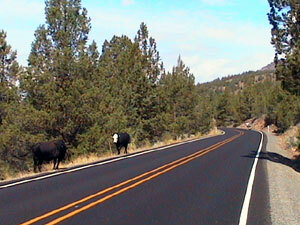 For some reason there were lots of cattle on the road today. They don't seem very interested in the cyclists or cars that pass within a few feet of them. 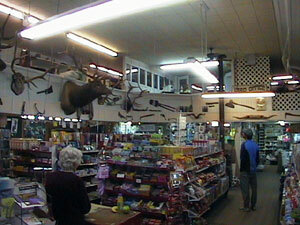 The second picture is of a bear that the gas station owner in Mitchell keeps as a pet. 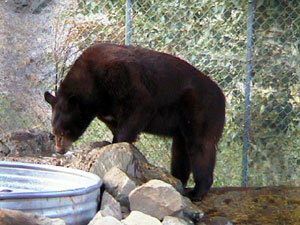 It's a two year old male black bear named Henry. The town of Mitchell, my home for the evening, is much like a lot of towns in this part of the country. Once a properous lumber town, this quaint little village is home to 200 residents, a gas station, a hotel, two cafes, and a grocery store. Joe and I arrived in town pretty early today, leaving plenty of time to do laundry, explore the town, and have two nice meals at the diner. The owner just bought the place last week and has only been open for three days. He is a great guy and is very open to suggestions about menu changes. 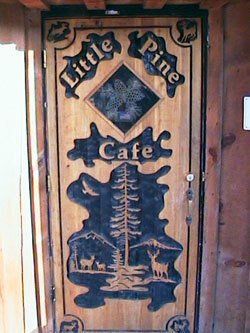 The cafe door is hand carved. 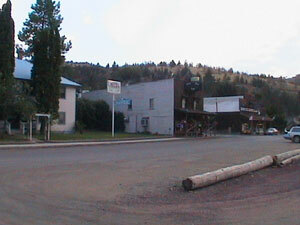 The Oregon Hotel here in Mitchell has hostelstyle accomodations for six people. 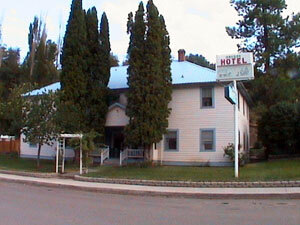 The hotel was built in the 1930s and is a very nice place with two queen size beds in each room and common bathrooms. The hostel part is simply a room with three bunk beds and minimal decor.